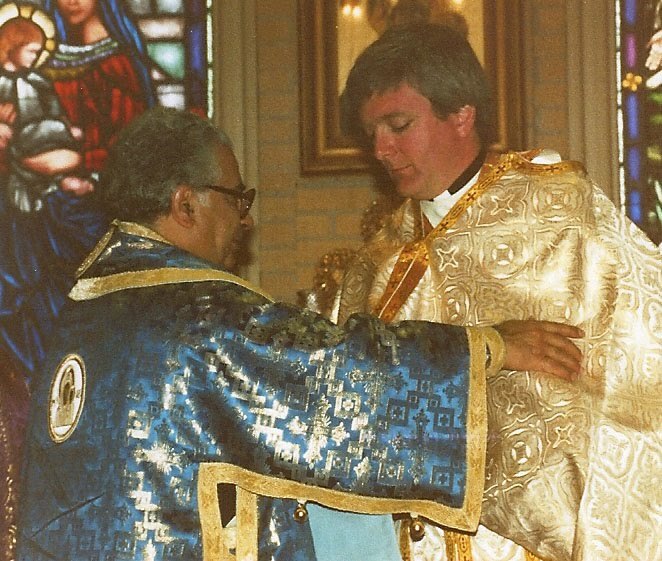 Bishop Antoun (left) and Father John Troy Mashburn (right) help Father Basil Cushman at his ordination on March 15, 1987. Our recently retired pastor, Father John Troy Mashburn, was also ordained that day, as were several other priests and deacons from St. John in Memphis and St. Peter in Jackson, Mississippi. This happened the day after a group of about 70 of us “pilgrims” were Chrismated into the Orthodox Church. For some of us, it was the end of a seventeen-year spiritual journey, one that was often wrought with peril, but a journey that ended (and in some ways began) with the blessed gift of finding the pearl for which we had been searching all those years. 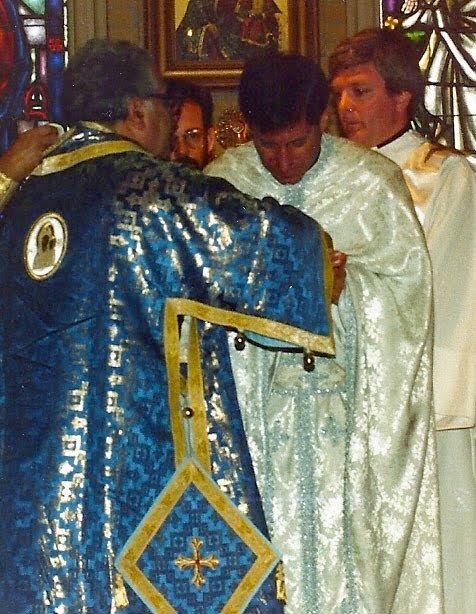 Bishop Antoun assists Father John Troy Mashburn during his ordination, March 15, 1987. If you’ve been reading my blog for a number of years, you know that there were some times when I was frustrated with my church home. Honestly, I still get frustrated at times. Orthodoxy is an ancient tradition (some say it was the first/original Christian church) and sometimes the very “rules” that have helped hold it together for centuries seem to hold too tightly. I’m not an obedient person, and I have always struggled against anything restrictive. But today I’m finding my way in this beautiful faith after thirty years. Tonight at St. John Orthodox Church—my parish here in Memphis since 1988—we will celebrate our clergy who were ordained thirty years ago. Most of them have served unselfishly while maintaining full time secular jobs, while others have sacrificed those secular careers to serve the church full time. Either way, they are all “full time” servants, and we thank God for them.